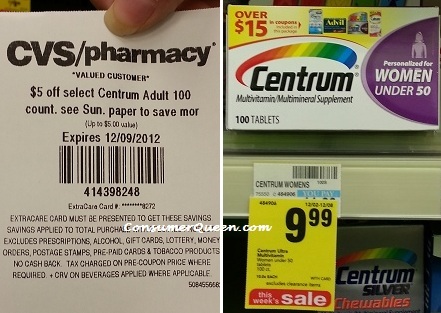 CVS: Great Deal On Centrum Vitamins! When I scanned my ExtraCare card yesterday at CVS I received a $5.00 off Centrum 100-ct. multivitamin purchase coupn. There is also a $3.00 off Centrum coupn in our redplum inserts this week that will score us vitamins for as low as .99! While I was there I noticed that just about everyone was getting this coupn from the scanner so your chances are good that you’ll get one too. I found 30-ct. more Centrum bonus packs and packs with free Gummy Bites so look for these when you shop for the vitamins. I found these vitamins with over $15.00 worth of coupns inside! There is also a $5.00/1 Centrum Specialist vitamins in the redplum to but I couldn’t find any at CVS that were 100-ct.